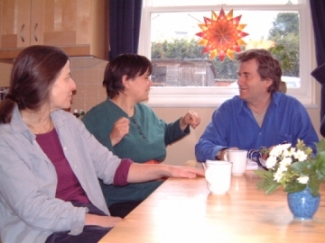 GANNICOX COMMUNITY is guided by a small group of currently five committed long-term live-in co-workers. Some of the co-workers are also the directors of Gannicox CIC. They take full responsibilty over all governance and welfare issues and cover roles such as CQC registered manager, contract management, health & safety and safeguarding officers. Co-workers hold appropriate NVQ / QCF qualifications as well as have undertaken training in Steiner based therapeutic, educational and management fields. All have extensive experience in guiding the work and life of a Camphill community. We would love to hear from people who may be interested in getting to know us and exploring the idea of joining us to start potentially between Sep 2019 and Easter 2020. In particular we are looking for live-in senior co-workers who would take on the co-ordination of a household and a management role. If this is you, please contact us; if you know someone else who should hear about us, please pass this note on to them.